Our original handcrafted designs are as sophisticated and unique as the women who wear them. Ropes, springs, rubber and other unusual materials are manipulated and transformed to the point where pieces require a second or third glance to truly recognise their origins. Industrial Jewellery, the unique and modern jewellery brand designed by Hila Rawet Karni, is proud to introduce the new SS19 Collection, Monochrome. Designed and handcrafted in our London studio, the new collection features a bold monochrome colour palette with the choice of yellow, red, blue, white and black.Inspired by artists such as Monderian we have kept this collection clean and geometric. We’ve refreshed old styles as well as introduced eye catching new pieces. Our major news this season is the launch of our wholesale website which should make ordering much easier for our clients. Keeping out clients in mind we hope offering a wider range of colours will give them the flexibility to create their own unique story out of the collection. 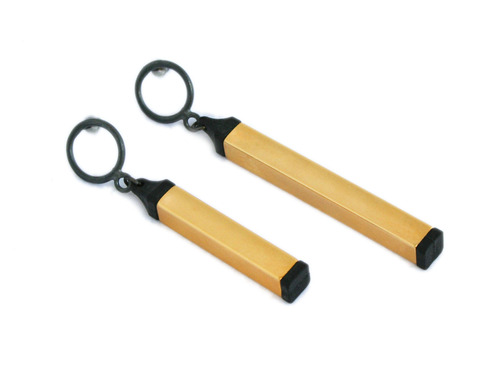 We have also designed a wider variety of personal accessories. 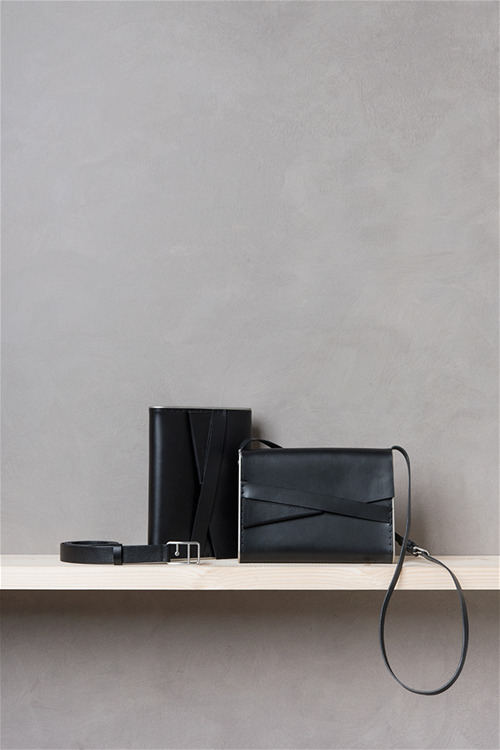 Our new line of leather goods is available in three colours which correspond with the jewellery collection. They feature hand-stitched leather bags, incorporating brushed and high-quality aluminium side panels alongside a modern belt with an architectural buckle. 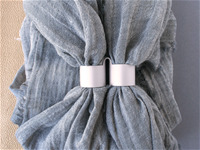 Our unique futuristic scarf fastener now comes in a variety of styles and metal finishes. There nothing else currently on the market. This season we have introduced 4 bold monochrome colours into the collection: Red, yellow, blue and white. 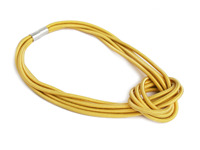 The necklace is made of natural, blackened, gold or rose gold plated stainless steel springs threaded with cotton rope. 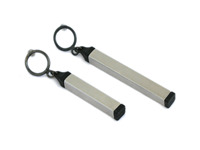 Magnetic clasps are plated brass. Necklace length is approximately 75cm-80cm. Made from silver plated brass. Silicone backs. Bead made from black anodised aluminium. 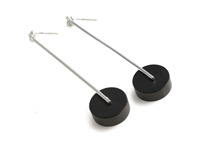 6.5cm drop to earrings. Bead 12mm x 6mm. Wire 1.4mm diameter. 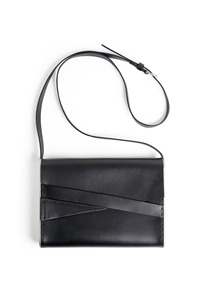 This cross-body bag comes with an adjustable strap and has an inside key-ring holder. Also available in Grey with Silver side panels and Brown with Gold side panels. The side panels are hand finished and polished aluminium either natural or gold plated. Italian leather is 100% vegetable-tanned. General size is: 25cm x 18cm x 4cm. Strap is 120cm long and 2.5 cm wide with a buckle to shorten if necessary. The top and base of the earrings are made of silicone. The centre tube of the earring is made of plated brass. Earring parts are oxidised sterling Silver. Earrings drop 5cm. 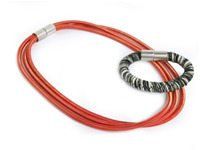 The magnetic clasps allow detatching the bottom detail to make a bracelet and the top worn as a deperate necklace. 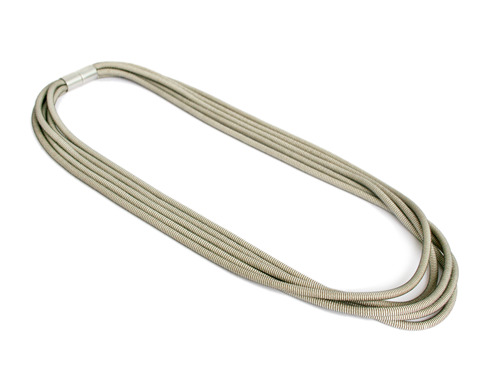 The top half of the necklace is made of plated stainless steel springs threaded with cotton rope. Total necklace length approximately 55cm. 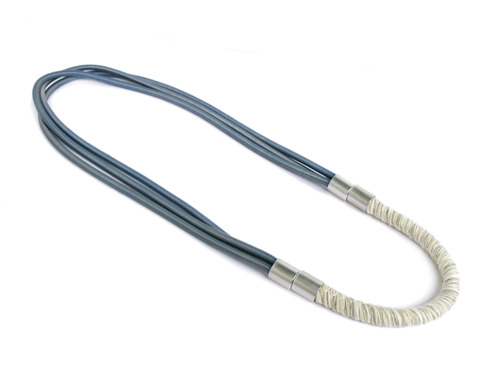 The lower half of the necklace is made of woven cotton fibers, length is approximately 20.5cm. Magnetic clasps and chain are plated brass. Scarf is made of extra soft fabric. 100% Cotton. Size is 205cm x 85cm. 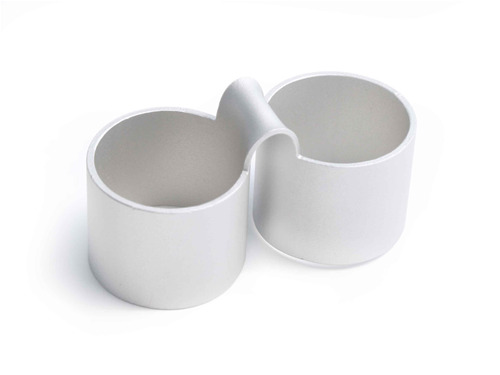 Fastener is handmade, matt finish, aluminium and is approximately 6.5 x 2.5xm.